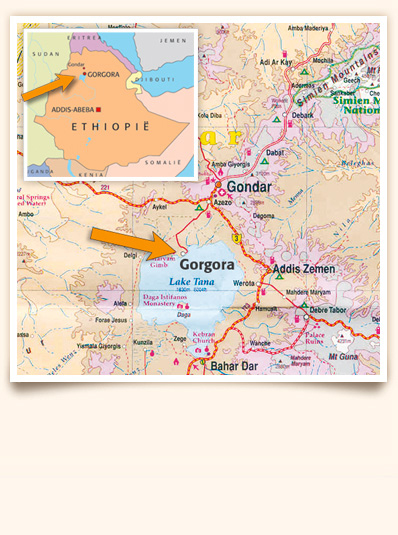 The country village of Gorgora is situated just 67 km south of the historical city of Gondar. You can reach the village from Gondar by taking the road that runs past the airport. The Tim & Kim Village campsite is situated just outside Gorgora. You can reach the campsite by car throughout the year. Ethiopia has a surprisingly extensive network of domestic flights operated by Africa’s most respected airline: Ethiopian Airlines. There are daily flights from the capital Addis Ababa to most cities across the country, including Gondar and Bahir Dar. From these cities you can take public transport to Gorgora. The local bus leaving from Gondar is by far the cheapest option and at the very least a real African experience. From 5am onwards the bus gradually fills with people and the bus departs once the driver considers the bus “full”. There is usually an afternoon bus as well that departs between 12 and 2pm. Travel time varies from 3 to 6 hours! There is a rapid car (bus) connection between Bahir Dar and Gondar (approximately 3 to 5 hours). Another option is the local cargo ferry across Lake Tana to Gorgora. Since it takes two days it’s not exactly an easy trip, but it’s a must for die-hard travellers!